I see young mothers all around me doing everything from dropping off their 6 year-olds for the first day of kindergarten to quick hugs outside their 18 year-olds freshman college dorm. They do it fast too! Like ripping off a Band-Aid. They shed ne’er a tear before they’re on their way to lunch with the girls or meeting with the interior designer to overhaul junior’s room. But watch an older mom take little Timmy to his first day of school. He’s chomping at the bit, pulling toward the Fisher-Price Tiny Tots Farm with all his weight and she’s weeping at an elevated level of histrionics like something out of Sophie’s Choice. And it doesn’t seem to get any easier from there. At least it hasn’t for me. My daughter turned 16 this past July and I have a whole list of BFI’s—Brace For It. • Driving: without me or her father, alone, fast, listening to and/or singing along with music on her ipod, with a friend who’s distracting her by talking instead of keeping her eyes on the road thus discouraging my daughter from talking back to her, at night, in the rain, when the sun is at that blinding level, even when it’s not, when there are other cars on the road, and why she’s been gone for more than ten minutes. • Boyfriends: while I trust her judgment in whom she chooses to be with and while she is pretty sophisticated about boys in general, I just don’t think she’s really ready for what a 16 year old boy wants. No offense to my readers who are parents of teenage sons, but you know what I’m talking about. Regarding rules – we’re damned if we do and damned if we don’t. If we impose rigid guidelines, there will be rebellion to contend with and we run the risk of driving her away and then she’ll hop into that car ( SEE: first BFI) and elope with that boy in Georgia just to make a point. If we give her complete and unrestricted freedom, she’ll take it and I’ll still be nauseous until she gets home from her date. And then she’ll tell me nothing. Oy vay. • College: Sure. I hear what you’re saying. “She’s 16! That’s two years away!” But to me it feels like tomorrow. Intellectually, I understand the concept that our children are only ours for a short time and we must let them go, but my gut and my heart march to a different drummer. Between you and me (and I swear I will NOT pressure her to do this!) I want her to go to a local college, live at home, finish her homework and invite me in to watch a tearjerker DVD at least twice a week, help me cook family meals (why not? She’ll get to eat for free as long as she stays home) and go shopping with me once in a while. And then, once she graduates, maybe look for a position in her chosen field within a 50-mile-radius of me. Oh, and there’s no hurry to move out. 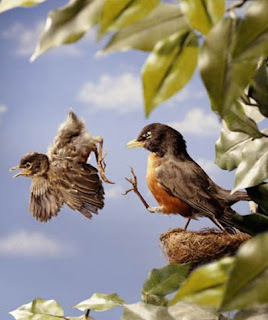 See this momma bird kicking her chick out of the nest? I know, I know. I’ve seen emotionally crippled young adults whose parents kept them utterly dependent and once on their own, they were completely helpless. I knew a boy in college who had never set foot in a grocery store. The first time he went food shopping for his apartment, he looked for packages of bologna on the bread aisle because it was logical that sandwich stuffs should be there. I’m not saying my clingy tendencies are healthy or even justified. Just the emotional ramblings and apprehensions of one gal who waited so long to have her dream baby and doesn’t want to wake up too soon. Oh, I love this! I think I've met my soul sister, because I think so many of the EXACT same things. I hope my little chicklets stay close to home, even when they grow up. It happens way too fast! Oh, and the part about dating boys. Don't even get me started! My oldest is only 9, and I'm already crossing my fingers and hoping she'll make good choices. Thanks for the wonderful comments Amari! I love learning about my soul sisters out there. Don't worry too much about your daughter - she'll make perfect choices although they may not seem perfect to you! But they will be just what she needs to grow and learn. Hah! I am so there with you. I'm a single mom, so it's always been just her and me. I've been telling her since she was 6 that when she goes to college, she gets to go ALLLLL the way to name-of-college-in-next-town-over. She started 5th grade today. I was a weepy mess all the way to work. To get some quality homework help for college students, you don't need to surf internet for weeks. You simply just visit this source and stick with it. Can anyone tell me how to start off an informative essay ?